White Alabaster Block - 4 lbs. Home → → Opaque White Alabaster Block - 4 lbs. Opaque White Alabaster Block - 4 lbs. 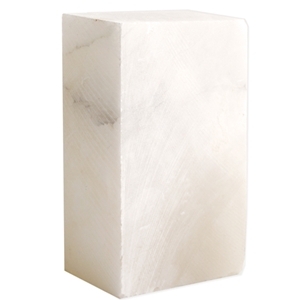 Our opaque white alabaster blocks are imported from Italy. The shapes of individual stones may vary slightly. These are a rough cut stone and will have minor chips and flaws as inherent in all natural stone products. Approximate dimensions: 2" w by 3" d by 6" h. Approximate weight: 4.0 lbs.